Woah!! 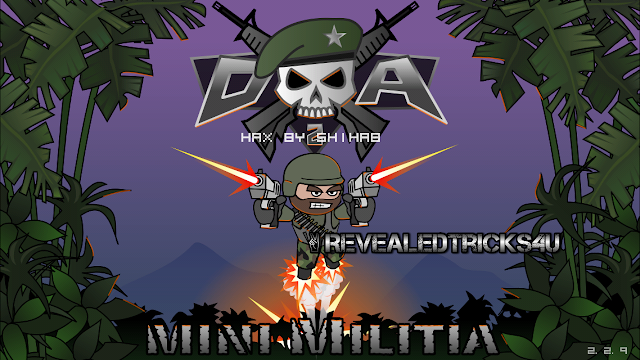 !, Here it is, the modified binary for the latest version of Mini Militia 2.2.15. It seems that a newer version of Mini Militia have been rolled out with version 2.2.15.I highly recommend you not to update the app from 2.2.9 to the latest one v2.2.15 until I make a modified library file for the latest version.Thanks for notifying me, A blogger. It would be released in day or two, stay tuned guys :). Note - Don't forget to read the last part of this post. Here I am back after a two long weeks.Sorry :). Well, as you know even thought I am not a frequent updater, but my updates will definitely make a large impact on you and already did, if I am not wrong :D.
Anyways, let's cut the crap. As the title mentions, the below information I am gonna share is for mere education purposes and for android enthusiasts.The changes will be permanent not like the previous hack mentioned in my previous post - "How to memory hack Mini Militia - Doodle Army 2(Android), one of the most popular games nowadays"
Before continuing, this modded APK and library files have been reverse engineered and modded by me.If you guys wanna use ma work in your website, then I prefer to link back to this post as a matter of gratitude. Unlimited Health - No damages will be taken and your health will never be down. Unlimited Flying power - You can fly as high as you want, fly booster is unlimited. Gravity - Gravity is disabled, so that you can stand mid air without falling. Unlimited Ammo or Bullets - You can throw unlimited grenades and unlimited fires without reloading. One shot death - I wonder you have never seen a mod like this on any other android multiplayer games.This will make you more a god in game, just take a weapon and only shot once, If it hits the other player then they are dead.Does'nt matter what weapon you use.This modification is a special one for my previous visitors. Download the file "libcocos2dcpp.so" from the downloads section below. Copy that file to your phone's internal memory or memory card.If you already got the file in your phone, then skip this step. Use any Root File explorer like ES Explorer, the one I have used to move this file and it is the best File explorer, I have ever seen. Long click that file and press Copy. Now navigate to "/data/data/com.appsomniacs.da2/lib/" folder and long press the file libcocos2dcpp.so and rename it to libcocos2dcpp.so.bak.This step is only necessary If you wish to play without modifications or with modifications.It helps you enable or disable the hacks. Now press Paste and move the previously copied file here. Well, its just a straight forward procedure just download the APK which has been recompiled with modifications, can be downloaded below. 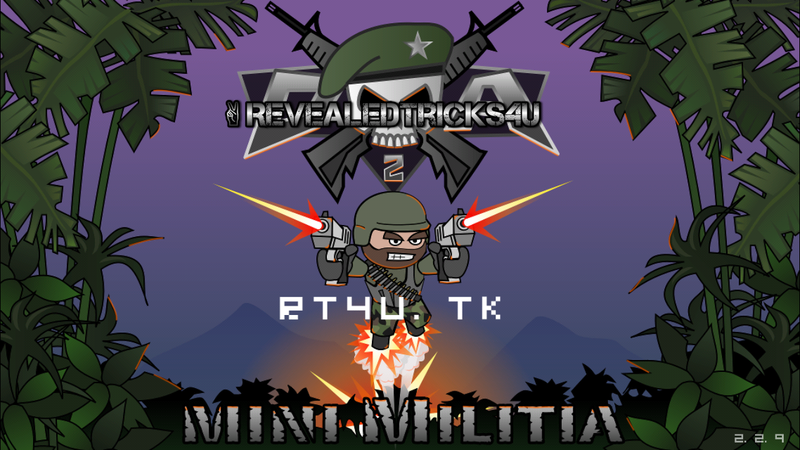 Now uninstall the previous Mini militia game and install the new APK. HURRAY!!! NOW OPEN THE GAME AND ENJOY PLAYING LIKE GOD. libcocos2dcpp.so - Click Skip Ad after clicking this link, to get the download page. If you guys need a toggle'able version of the above mentioned mod, then let me know through comments.  As you might know, comment box is feeling so lonely, nowadays :(. Stay tuned for a game play video. HERE IS THE BIGGEST SURPRISE, THE ABOVE MENTIONED MODIFICATIONS WILL WORK ON ONLINE MULTIPLAYER OR QUICK PLAY TOO. i have got a mistake in the old version (2.2.9). I CAN'T kill SOME ENEMIES in " SOLO PLAY -> survival"
You don't need to apologize for your language, anyways you have good English knowledge :). Well that's a known bug as you can't kill Humanoid robots because the Robot's and your's damage taking code are same.So If I patch the damage taking code to always give you full HP, then it will affect other robots too. Anyways I will try my level best to modify the code as per your request. Hi.. Nice hack..works good.. But the app crashes in between the quick play session.. Then have to restart the app.try to fix this please.. Also feature request :modify battle points (BP) so u can buy stuff.. Thank u so much for your work.. Much appreciated! I highly recommend you to clear App data before replacing the library file. Can you please give out which version of App you use? I ain't got any crash so far, while playing online. For getting unlimited coins, experience, kills, deaths, etc.I prefer you to use an App called Cheat droid.As there was already an App there to do that job for u, I don't wanna waste my time recreating something like that :). Much appreciated, as you've spent your valuable time to comment here. Your phone's name and Model number? Its strange that I never got a crash or some kinda problem with the app. You were getting just occasional crashes or frequent crashes? And what made the crash, like pressing the bomb repeatedly or firing repeatedly? If you give more details, I may patch the mod and re-upload it. crashes in MI4 also same time while playing online quick play! Okay I did a bit of Testing... It crashes everytime on quick play. Also if I don't interact with players at all I can stay through the match with zero kills. Lemme explain a bit.Hope you read the words "One shot dead" in the title.Lemme explain that for you.I have reverse engineered the mini militia game library to fire 5 bullets, when you shoot once.You may see the thickness of bullet regarding to original game.Its thicker than the original game, when we fire the bullets.I used to play with just a Deagle or Colt 45(I don't know the gun's real name :D).Never use guns that does rapid fires such as M4 or MP5 or AK47.I highly prefer not to switch weapons while playing in online mode.As it tends to crash the game, because we know that our guns got unlimited ammo and I have programmed the ammo section in the game to give unlimited bullets by just pointing the R7 register(That's a bit technical, don't worry. ).So when u switch the guns your gun with unlimited ammo will be dropped down, some servers in Mini militia can't hold the large number and it crashes your app. Join quick play game, just start killing other players with the default gun you have in your hand at the spawn time.Keep in mind that, you just have to shoot once and it will kill the enemie as u shoot it fires about 5 bullets. If you are feeling comfortable to provide a log, I would highly appreciate it, as it gives more info. I really love your words :). 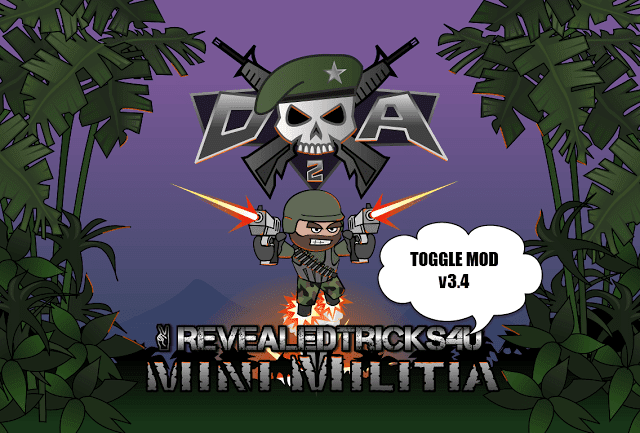 Mini militia latest version's mod apk and library will be released soon. And please suggest, If you want mods for your favorite and popular games through this link http://www.revealedtricks4u.com/p/contact-me.html. Thanks for your time being a part of this website. While i was playing this game on quick play, all another players are freezing in midair.. I can move all around the map.. But there were no players to kill. :( all are freeze.. Anyway sir ? Join quick play game, just start killing other players with the default gun you have in your hand at the spawn time.Keep in mind that, you just have to shoot once and it will kill the enemy as u shoot, it fires about 5 bullets at the same time. "Lemme explain a bit.Hope you read the words "One shot dead" in the title.Lemme explain that for you.I have reverse engineered the mini militia game library to fire 5 bullets, when you shoot once.You may see the thickness of bullet regarding to original game.Its thicker than the original game, when we fire the bullets.I used to play with just a Deagle or Colt 45(I don't know the gun's real name :D).Never use guns that does rapid fires such as M4 or MP5 or AK47.I highly prefer not to switch weapons while playing in online mode.As it tends to crash the game, because we know that our guns got unlimited ammo and I have programmed the ammo section in the game to give unlimited bullets by just pointing the R7 register(That's a bit technical, don't worry. ).So when u switch the guns your gun with unlimited ammo will be dropped down, some servers in Mini militia can't hold the large number and it crashes your app." I am about to create an Android application which is used to toggle different mods like Unlimited health,Flying etc.So you don't have to reinstall app each and every time If you wish to play fair. Stay tuned for the app.I always kept ma promises :D.
while playing online if m dying game is crashing tell me what to do.